A Stratford High School and Belmont College graduate giving back to his alma maters… A Peabody College alum and long-time teacher offering a gift to support deserving students… a couple who passionately believe in—and have personally experienced—the power education can have to dramatically change lives for the better. Meet HCA Chairman and CEO Milton Johnson and his wife Denice, who today announced they were donating $10 million to Belmont University to create the “R. 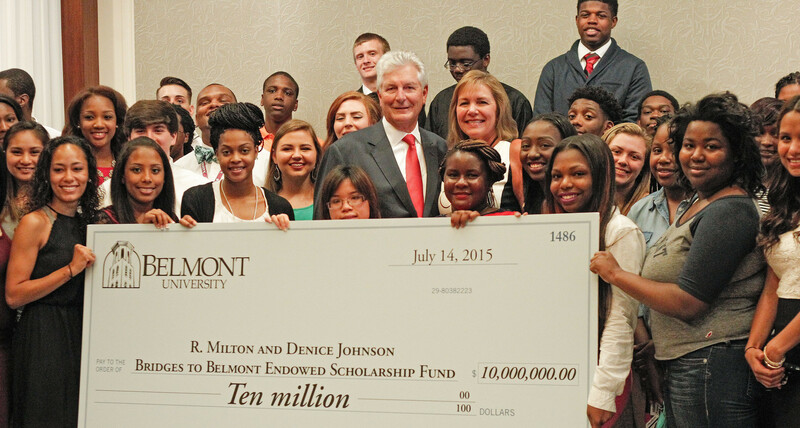 Milton and Denice Johnson Bridges to Belmont Endowed Scholarship Fund.” Launched in 2013, the Bridges to Belmont initiative was designed to enroll qualified, high potential students from Metro Nashville Public Schools who may not have previously been able to consider Belmont as an option. Bridges Scholars are currently selected from four Metro Nashville Public Schools—Stratford, Maplewood, Whites Creek and Pearl Cohn—and most of the scholars are first-generation college students. Milton Johnson attended Nashville’s Stratford High School, working multiple jobs to help his single mom support their family and forgoing many of the typical extracurricular activities most teenagers enjoy. It was a habit he continued during his tenure at Nashville State, balancing the weight of a full-time job with the stresses of completing college courses, believing education could someday catapult him into a different situation. He also began dating Denice at that time, who was studying at Peabody to be a teacher and who shared Milton’s passion for the power of education. Milton’s hard work paid off when he was offered an academic scholarship to what was then Belmont College, paving the way to an accounting degree and rapid career advancement in Nashville’s healthcare industry. Today’s announcement allows the Johnsons to “pay it forward,” giving potentially hundreds of young people an opportunity to better their situations and follow in the Johnson’s footsteps. Junior Summer Shack, a theatre major, spoke at the press conference about the impact being a Bridges Scholar is having on her life. Bridges to Belmont reflects a deliberate step on the part of Belmont’s administration to enhance the University’s cultural and ethnic diversity while also continuing efforts to provide higher education to students in Davidson County. Bridges to Belmont Scholars are awarded a full four-year scholarship that covers tuition, room, board, required fees and books (with Belmont funds being supplemented by appropriate state and federal grants). Throughout their higher education experience, they also are given academic support and faculty/staff mentors. In February, it was announced that the program would be expanding its scholarship offerings to 34 students, up from the original 25, for the Fall 2015 entering class. Currently in its third year, the Bridges to Belmont cohort will include a total of 80 Scholars on campus this fall. Scholars’ majors of study range from commercial voice and accounting to biology and social work, and they are involved in activities across campus, including roles as orientation leaders, members of business and student activity groups and as intramural athletes. Scholars participate in community service projects in the summer and throughout the academic year. This summer alone the incoming class will give approximately 400 hours of community service. Milton Johnson is chairman and chief executive officer of Nashville, Tennessee-based HCA where he began his healthcare career in 1982 following a period as a practicing CPA at Ernst & Young. In his role, Johnson leads a company that includes approximately 168 hospitals, 113 freestanding surgery centers in 20 states and the United Kingdom and was responsible for more than 20 million patient encounters in 2014. Denice Johnson graduated from Peabody College of Education and Human Development at Vanderbilt University and taught locally for nearly a decade at several schools, including the Kennedy Center Experimental School (now Susan Gray School on Peabody’s campus), the University School of Nashville and Woodmont Christian Preschool. Committed volunteers, Milton and Denise Johnson have supported a number of organizations within the community, including Partnership 2020, the Nashville Health Care Council, the United Way of Metropolitan Nashville, the Frist Center for the Visual Arts and the Women’s Auxiliary of the Salvation Army and Siloam Family Health Center.